Cabeau, a world leader in consumer travel products available in more than 110 countries, will be exhibiting at TFWA World Exhibition and Conference (Stand E39) with its newly improved Evolution Cool®. The original Evolution Cool® has won multiple awards and praise worldwide for its sleek design, innovative cooling technology and fashionable functionality. 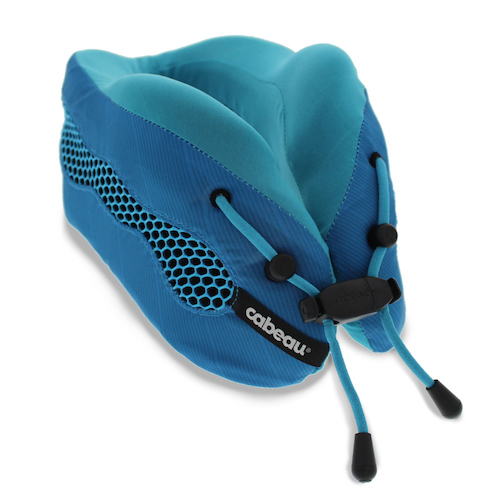 Always listening to its customers, Cabeau used valuable feedback to improve key features of the top-of-the-line travel pillow, with the main focus being on providing an even better fit for all neck sizes. “User feedback is so important if you are going to continue to maintain a loyal fan base,” said David Sternlight, Founder and CEO of Cabeau. “Yes, the original Evolution Cool® won awards and we have seen fantastic global sales, but we can always improve on the look and design of a product, and what better way to do this then by listening to our consumer base and taking on-board their feedback.” With new colours including, Purple, Black, Red and Blue, the Evolution Cool® has an upgraded list of features: A BETTER FIT FOR ALL NECK SIZES – Offering complete adjustability. Magnetic securing clasp and cord loops work together to provide a custom fit for all neck sizes, from small to large. STAY COOL WHILE YOU SLEEP -Innovative air circulation vents keep you cool at any altitude. FIND YOUR COMFORT SPOT- Adjust for the perfect 360° support, whether your head leans left, right, or tends to fall forward. REMOVABLE, WASHABLE COVER - Moisture-wicking fabric absorbs perspiration, and can be washed. ROLLS UP FOR EASY STORAGE - Our deluxe travel case compacts the pillow to ½ its size for quick and convenient packing. MEMORY FOAM EARPLUGS - Drown out your snoring neighbour and other ambient noise to rest better. Adds Sternlight, “TFWA World Exhibition and Conference is the most important date in our travel retail calendar. There is no other event that brings every buyer and supplier in the industry together in one location – it’s the ultimate place for us to launch updated the Evolution Cool®. We are looking forward to receiving feedback from our current customers, and we are confident that we will attract some new business with this fantastic new version to our award-winning portfolio.” With nearly 450 exhibiting companies, TFWA World Exhibition and Conference gathers the world’s entire duty free and travel retail industry in one convenient location, providing the ideal environment for networking, sharing knowledge and doing business. For more information on TFWA World Exhibition, visit www.tfwa.com. For more information on Cabeau and to see the entire travel collection, please visit www.cabeau.com.